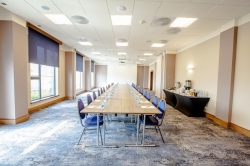 Park Hotel Diament Wrocław**** is a modern, air-conditioned business hotel located only 10 minutes drive both from the historic Old Town and the Wroclaw Airport. 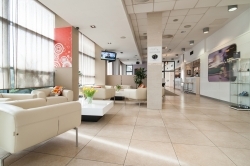 The location of the hotel makes it easily accessible from Krakow, Poznan or Berlin. The hotel is also a perfect starting point to visiting numerous monuments and tourist attractions of Wroclaw. The Hotel offers 132 comfortable and well-appointed rooms that feature air-conditioning, sattelite TV, complimentary Internet access, phone, radio, tea and coffee making set and bathrooms with hair dryers. For the youngest we have prepared a special offer for families. We offer spacious family rooms consisting of rooms connected to each other. Parents' room is connected to the children's room, where there are many attractions - a fairy tales TV program, colouring books, crayons and markers. In addition, thinking about the safety of children we have secured electrical outlets . Our Restaurant Atmosfera serves children 's menu. 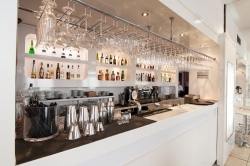 Restaurant Atmosfera is located on the ground floor of the Park Hotel Diament Wroclaw. The unique decor of the restaurant leaves guests the opportunity to choose the place: on comfortable sofas, specially separate lodges, which create conditions for discrete conversations, or traditional tables, giving the ability to adapt to a more numerous company. The menu is rich in light and health dishes made from carefully selected Polish products. Our team of chefs ensures that the menu changed with the seasons and our guests always have the opportunity to enjoy the seasonal specialties. The spacious and bright interior of the restaurant allows the organization of small family or business meetings, as well as banquets, conferences, weddings and other events for the maximum number of 350 guests. Lobby Bar placed at the restaurant is the perfect place for an afternoon cup of coffee, relax after a hard day or celebrate a successful deal with business partners. The bar will offer a wide selection of spirits, and our staff will help you compose the drink according to your preference. Our guest may use free Wi-Fi. Moreover, hotel has specially prepared fitness room and private secured parking. We also offer special diet meals (on request), kids' meals, packed lunches, cash mashine, dry cleaning, laundry, shoeshine, fax/photocopying, shuttle service, press, safe, souvenir shop, facilities for disabled guests, heating and air-conditioning. Pets are allowed (charges may apply). 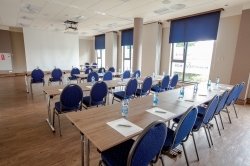 Spacious and modern Conference Center with a capacity of up to 250 people is perfect for conferences, trainings and interviews. Variously sized rooms with a moveable wall system make it possible to arrange the space according to your needs while complimentary Internet access and professional audio-visual equipment guarantee comfort and high level of service. We also provide technical support and catering (coffee breaks, lunch) as well as help in organizing fringe events. High standard of service and years of experience in hosting events in the Diament Hotel Wrocław guarantee satisfaction and business success. All children aged 6 free of charge stay if they sleep on existing beds. All children from 6 to 12 year are charged PLN 45 per person per night when using existing beds. One additional older child or adult is charged PLN 100 per person per night in an extra bed. Spacious and modern Conference Center with a capacity of up to 250 people is perfect for conferences, trainings and interviews. Variously sized rooms with a moveable wall system make it possible to arrange the space according to your needs while complimentary Internet access and professional audio-visual equipment guarantee comfort and high level of service. We also provide technical support and catering (coffee breaks, lunch) as well as help in organizing fringe events. 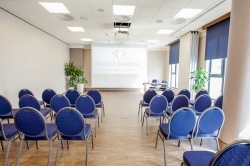 High standard of service and years of experience in hosting events in the Diament Hotel Wrocław guarantee satisfaction and business success.